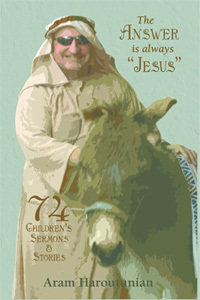 ABOUT THE BOOK…….Seventy Four Children’s Sermons for all occasions. Pastors, homeschoolers, parents who often lead family devotions, or other storytellers will find these stories, along with comments about props and how to prepareand present them, to be an invaluable asset in reconnecting with the simplest, most profound truths of Scripture, and then to envision how best to communicate these so even a child can understand them. ABOUT THE COVER…….This is the author with one of his favorite Palm Sunday “props,” “Firecracker,” who carried Aram down the aisle many times, to the delight of children and adults, alike. Aram Haroutunian’s creativity and compassion for expressing the Persons of the Trinity to children is like none I have heard or read. His orations are disguised by humor, masquerade, dialogue and broad imagination. The author believes the children’s sermon serves an important social, emotional, and theological purpose in the worship service. Pastor Haroutunian explained that in his church community they often joke that the answer to every children’s sermon question is Jesus, thus the title of this book. In my opinion, this author/pastor must be quite a hoot to be around. “Hoot” being a term understood by children. Dialogue with children can be quite risky, with children’s unpredictable responses, “which I find to be the best part of doing children’s sermons!” quoting the pastor. He has shared some actual responses of children to his questions during the children’s sermon. “Their responses are often surprising, refreshing, profound, hilarious, innocent, challenging, and even piercing.” Personally, I enjoyed many laughs while reading Aram Haroutunian’s chapters. He owns a great sense of humor and often directs fun at himself to make a point. This book could be a great advantage to Sunday school teachers and story tellers in general. Each chapter or sermon is created through several basic premises keeping in mind the subject and scripture of the main worship sermon; the first being the BIG IDEA or the subject matter of the lesson. CORRESPONDING SCRIPTURES are provided, to highlight the biblical concepts that the sermon is intending to convey. An OVERVIEW is offered, to develop and illustrate the New idea or thinking behind the children’s sermon. This can assist in developing a “way of thinking” about the implications of the New Covenant. A list of MATERIALS IS GIVEN (INCLUDING OBJECTS OR PROPS.) Of course these can be adapted for different settings and for when certain resources (such as audio-visual equipment) is not available. The ACTUAL SERMON is then written out. Included in some of the sermons are actual responses by children. These illustrate the importance of structuring the sermon in such a way as to elicit responses and dialogue from the kids – which, of course, brings joy to the sermon when preached. A CLOSING PRAYER is offered, which serves important purposes. The obvious importance is to offer the entire sermon to God, so that the Holy Spirit might seal the truths discussed in the minds and hearts of both the children and the adults. Yet the closing prayer also serves to recap or summarize the Big Idea, and can help pull it all together particularly for the adults, who will remain in the service. Pastor Haroutunian describes some of the antics he has courageously performed like riding a donkey…or attempting to ride a donkey into the Palm Sunday service. You might not believe what you are reading about the nervy feats he accomplished delivering the children’s moment. Wild and weird to say the least! One of my big questions was where he found some of the objects used, and how many trips he made from his vehicle to the altar with his various questionable props. This gentleman has gone to faith-full lengths to bring out the answer “Jesus” to his questions. I intended to tell you my favorite sermons in the book, and decided to leave it to you to get this helpful novel and pick your favorites. Frequently I have done the children’s moments during worship. I am so grateful to Pastor Aram’s sharing his perfect ideas of teaching “Jesus” to children – as well as to adults. He is gracious and sensitive toward the teachings of Christ and I personally plan to pass on his children’s sermons to our children in worship. FROM THE AUTHOR…….A New Covenant approach to life will be descriptive of Jesus rather than prescriptive. It is to embrace the incredible mystery and paradox of the Gospel (“For whoever desires to save his life will lose it; but whoever loses his life for My sake will save it” Luke 9:24). Ironically, children are more able to grasp these concepts than are we adults. And yet, I have observed that of all places where the spirit of the New Covenant is violated most frequently, it is in children’s curricula and children’s sermons. “Do good things to others, and good things will happen to you.” “Live in a godly way, and things will turn out great for you.” We set our children up for disappointment by instilling in them (albeit unintentionally) a belief in a “push-button God.” And we’re as surprised as they are when their alleged faith crashes upon the rocks of harsh reality once they leave home. We think we need to explain to them every mystery and paradox of God – that this will adequately equip their minds. But all the while – just like us – they’re longing to be captivated in their hearts by something bigger. They want to encounter Someone who can’t be reduced to a set of principles, Someone who promises to fulfill their young hearts’ desire for adventure and wonder. ABOUT ARAM HAROUTUNIAN…….Aram Haroutunian earned a ThM from Dallas Theological Seminary (1987) and an MABC from Colorado Christian University (1994). He and his wife, Ellen, have been married since 1982, and they are the parents of two grown children. His previous writings, on topics ranging from the arts to theology, have appeared in The Mars Hill Review. They live in Colorado. Check my Book Giveaway Page to see current contest!